The Council for Economic Opportunities’ Central Neighborhood Opportunity Center is hosting 14 area employers and welcomes the public to join us for a job fair. The fair is scheduled for Friday, October 27 from 11 a.m. to 2 p.m. at 1801 Superior Ave., Suite 400. Fourteen area employers will be on hand to fill seasonal, part-time and full-time employment positions. The companies committed cover a variety of specialties: Jack Casino, Spectrum Cable, The Revenue Group, Dave’s Market, Allied Universal, Champion Personnel, Citizens Bank, Hospitality Staffing, Koinonia Homes, Bon Appetit, Provide a Ride, Orlando Baking, State of Ohio Minority Outreach and McCarthy Burgess & Wolff. We encourage you to bring your resume and dress professionally, as employers will be conducting on-the-spot interview. CEOGC representatives will also be on hand to discuss upcoming job and career and personal and family development workshops. Plus, learn more about our high-quality Head Start program and enroll your child for this school year! The job fair is free and open to the public. 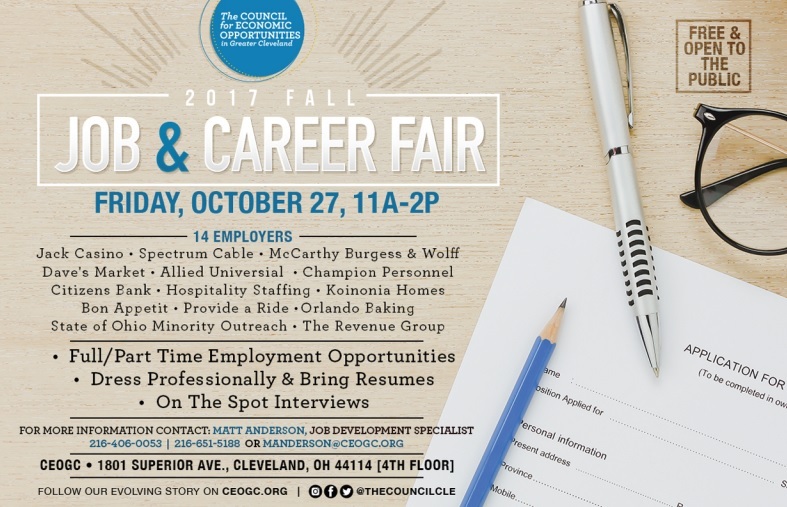 For more information, please contact CEOGC’s Job Development Specialist, Matt Anderson at manderson@ceogc.org, or 216-406-0053.